Will the Bokashi system work in a restaurant or commercial kitchen? Yes. We have an integrated waste separation plan that separates food waste from dry waste. The food waste is processed through a macerating machine reducing the volume by up to 80%. We will train your staff on the full process. Give us a call on 082 456 9225 to get the conversation started. Why can your bokashi digester bucket smell bad? How long does it take to fill a Bokashi Bran Digester Bucket? That depends on the size of your household and how much fresh food you consume. If you cut up food scraps into small pieces it will allow more room for other scraps in your bokashi bin and also assist in speeding up the decomposition in the garden. Press the food waste down with a potato masher to compact the contents which will also help to drain any liquid to the bottom of the bokashi bin. A typical family of 4 would normally fill the bokashi digester bin in 3 – 4 weeks. The Bokashi Bran digester bins are 25 litre capacity. Has my Bokashi bucket gone “bad”? You will smell if your bucket is going bad. If it smells rancid then add two cups of Bokashi Bran to try and reverse the contamination. If the bucket continues to smell bad then you will have to get rid of it by digging a hole and adding the bucket contents to it. Pour a kettle of boiling water over the contaminated waste and then add another 2 cups of Bokashi Bran. Cover with soil. What do I do if my animal or child has eaten some Bokashi Bran? Absolutely nothing! Bokashi Bran is made with probiotics that is brewed with food grade mother culture EM. Humans probably will not like the taste but animals will. The microbes in Bokashi Bran are very common in nature and are not pathogenic. The probiotics are found in cheese, yogurt, breads and wines. I don’t have garden space to bury the Bokashi waste. Do you have any other suggestions? Get a “stand-up” composting bin. Make sure you position it on the soil and not concrete so the decomposers can get into your compost. Start with a few spades of soil or potting soil in the bottom of the bin. Add the contents of your fermented Bokashi waste. Cover up the Bokashi waste with a few more spades of soil, fallen leaves and grass cuttings. After 4 to 6 week, you’ll see that most of the waste has converted into very concentrated, rich compost. Scoop it out and mix it with soil in your garden. I’ve tried all the home remedies to get rid of ants in my vegetable garden with little success. Do you have any suggestions? I also tried all the natural, home remedies from garlic to sunlight liquid to pepper to curry powder. No success. I then took a bag of Bokashi and sprinkled it down the ant holes. They really don’t like the Bokashi and left my vegetable garden. In fact, whatever was eating my spinach also left. Can the Bokashi tea be used to propogate trees? Yes. Take 1 cup of Bokashi tea and mix it with 2 litres of water. Take the tree cutting and leave it in the Bokashi tea solution. After 5 days you’ll notice the roots forming and by day 10, it’s ready to be planted. Place your Bokashi Bucket somewhere close to where your food waste is produced. It must be convenient. Sprinkle a small amount (handful) of Bokashi onto the straining tray at the bottom of the bucket. Keep a vegetable bowl on your counter when preparing your meals. Add any leftover food from the meal to your bowl. You want to open your bokashi bucket as few times as possible. Add your food waste to the bucket within 4 hours of putting it in your vegetable bowl. Any longer and the food waste will start putrefying. Anything you produce in the kitchen can be added – bread, citrus, vegetable scraps, egg shells, small amounts of paper, even meat. Compress the waste in the bucket with a mashing utensil, to remove any air pockets, and compact the material. Add a small sprinkle (handful or about a third of a cup) of Bokashi over the food waste so that the entire surface area is covered. Once or twice a week, drain the liquid from the bucket. You can dilute this with water at about 1:300 ratio, and water it onto your lawn or garden beds. Alternatively, you can add the undiluted liquid directly to your drain where it will eliminate any unpleasant odours. Repeat the process until the bucket is full. For an average family, this will take about 3 or 4 weeks. When the bucket is full, empty the contents into a trench in your garden or add it to the inside of a compost pile. The waste material will be fermented, but it will not be broken down at this stage – it needs to go into the soil to physically break down into humus (soil). Rinse the bucket with water and an eco-friendly detergent, drain and repeat the whole process. In 2 to 3 weeks, the waste you have buried will then be mostly broken down into soil, and will be rich with nutrients, microbes and enzymes, all naturally produced. Why has my food waste not composted in the bucket? The waste material will not break down in the bucket – it will only ferment it. The physical break down of the waste will only begin when you empty the bucket into the soil – and because it is already fermented, it will break down very quickly. NOTE: You can leave your Bokashi Bucket even when you go away on holidays – just make sure that the lid is sealed, you’ve added a layer of Bokashi, and you’ve tapped off the tea from the bottom. The longer you leave the bucket to ferment, the “sweeter” the material will be when you return. NOTE: Be careful NOT to allow pets to eat the fermented waste. While there is nothing harmful in Bokashi, partially decomposed food waste can cause harm to some pets. The Bokashi Bucket uses beneficial microbes to FERMENT organic waste, rather than compost it. The end result is a fermented (or pickled) mass of waste which can go straight into the soil or into a compost pile. How much Bokashi do I use? Just a light sprinkle over the top of the waste in the bucket. As long as the surface area is covered, that is enough. 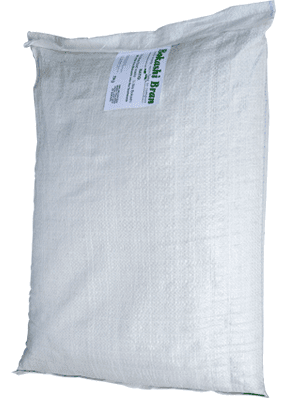 The 1 kg bag of Bokashi should last the average household about 3 – 4 weeks. Are the beneficial microbes safe? Absolutely. The types of microbes used are those already found in many types of food, including cheeses, wines and yoghurts. Bokashi is made with both aerobic and anaerobic microbes. Yeast is the fermentation starter, lactic acid bacteria is what you’ll find in cheese and yoghurt and phototropic bacterial are essential for the carbon / nitrogen combining in the composting process. How long will it take to fill the bucket? Most households will take about 3 to 4 weeks to fill the bucket, depending on how much fresh food you prepare. Your starter kit will cost R490 which includes 2 buckets plus 2 bags of bokashi. You will then use a bag of bokashi a month at a cost of R62 – less than R2 per day. Is fermenting good for the environment? Fermenting waste is far, far better than traditional composting. Greenhouse gas emissions are greatly reduced during fermentation, there are no insect or rodent problems, and the end product is extremely valuable as a soil conditioner. Why is my Bokashi growing white mould? White mould is a good thing in your bucket. It shows the process is working. Bokashi contains living microbes and if the microbes are exposed to the air they will start to grow. How often should I drain the liquid? Every three days or so, or more if you are getting a lot of liquid draining off. The liquid starts to form when the food waste starts fermenting. What can I do with the liquid? This liquid is teeming with microbes and nutrients! You can dilute it and use this directly on your garden or pot plants: dilute 1:1000 for foliar spray or 1:300 for lawns and garden beds. Or, if you have a septic system, you can add the liquid undiluted to the toilet or septic tank. The microbes will work to make the septic system more efficient. Or, you can simply tip it down the sink – the microbes will go to work on your drains and keep them clean. How much liquid will I get from the bucket? The amount of liquid that you get will be totally dependent on the type of waste you have put in – lots of fruit will produce lots of liquid, but if you have lots of cooked food, vegetables etc., then you’ll get less. The amount of liquid you get is not an indicator of whether the system is working, and you won’t get any more (or less) liquid by increasing (or decreasing) the amount of Bokashi you add. How can I order more Bokashi? You can order online in our online shop. Simply drain the liquid from the bucket, make sure there is a cover of Bokashi on the waste, and that the lid is firmly sealed. Then forget about it! While you are gone, the microbes will keep the waste odour free. What can I put in the bucket? Any type of organic matter produced in the kitchen. So this means you can add vegetable scraps, tea leaves, tea bags, small amounts of paper, coffee grounds, even onions, citrus and garlic, even meat scraps. What can I NOT put in the bucket? Do not put dog or cat faeces in the Bokashi Bucket as these are a human health risk. The only test on whether the system is working is the absence of the rotting odour. If there is no such odour, then the fermenting bugs must be doing their job in fermenting the waste. Normally, waste left in a bucket will go foul within a day or two, and if this is not happening then you are doing everything right. The waste hasn’t broken down in the bucket. What’s wrong? The Bokashi bucket will NOT decompose the food waste while it is in the bucket – it will only ferment (or pickle) it. If you can imagine a pickled onion – it will still look like an onion, but because it’s pickled, it will have changed its internal structure. The single criterion to determine if the process is working is the odour – if there’s no rotting odour, then the fermentation process is working. The physical decomposition into humus only occurs once the fermented food waste goes into the soil. Here, it breaks down very quickly because the material has been pre-conditioned (i.e. fermented) and should turn into humus/soil within a couple of weeks (varies a bit with soil temperature). We hope you will love our products but for whatever reason you decide that what you received is not what you want, we’ll be happy to refund your money. We will accept any unwanted items up to 30 days after receiving your order. We will charge a 20% handling charge for any items returned after 7 days of receiving your order to cover admin costs. Please email us at info@bokashibran.co.za and let us know why you wish to return your order. The cost of returns must be covered by the customer, we, unfortunately, do not provide a collection service. The returned items must be in new condition and in their original packaging. Once we have received and inspected the goods, a refund will be transferred by EFT. Please ensure you supply your banking details on your email.